Use the search box below to locate a word - exact spelling is required. Click on a letter in the alphabet below to see all definitions beginning with that letter. Click on a letter to see definitions of all words beginning with that letter. Abaxial - facing away from the main axis e.g. lower surface of a leaf. Abiotic - of non-living environmental factors (precipitation, temperature, wind) that affect living members of an ecosystem. Abortive - development arrested while incomplete or imperfect. Abscise - to cut off. Hence: abscission, the normal separation of a leaf, fruit, or flower from a plant. Abscisic acid - a plant hormone that induces abscission of leaves, dormancy and other adaptations to poor growing conditions. Acanthocarpa - bearing spiny fruit. Also echinocarpa. Acanthodes - (Greek: acantha = thorn) full of thorns or spines. Acaulescent - without a visible stem. Accrescent - continuing to increase in size after maturity or flowering, especially of floral parts. Accumbent - of a pair of cotyledons curving back towards the hypocotyl so that their edges are turned towards the hypocotyl. Achene - a small, dry, indehiscent fruit with the seed distinct from the pericarp (fruit wall) which is generally attached to the seed at a single point. A naked seed. Acicular - needle shaped, applied to an elongated tapering structure with a circular of eliptical cross section. Acre - A measure of land area equal to 43,560 square feet, 4,840 square yards or 160 square rods (Metric: 4,046.87 square meters). One square mile equals 640 acres. Actinomorphic - of flowers that can be divided into symmetrical halves by cutting across any diameter. Aculeate - armed with prickles. Acuminate - with a long pointed structure formed by abrupt narrowing at an apex. Acute - ending in a sharp point, forming an angle of less than 90 degrees. Acutifolia - with pointed leaves. Adaptive radiation - the diversification of a species under different, local environmental pressures to which it becomes adapted, eventually leading to the emergence of new species. Adaxial - nearest to or facing towards the main axis e.g. upper surface of a leaf. Adhesion - of two dissmiilar parts touching each other but easily separated and not fused or grown together. Adnate - of unlike parts growing closely together, attached or fused. Adpressed - lying close to another organ, but not fused to it. Adventitious - arising in an irregular or unusual position such as roots arising other than from the radicle or primary root system; adventitious buds forming along a stem, generally in response to an injury. Not in the usual place. Aenea (-us, -um) - bronze coloured. Aerial - occurring above ground or water. Aerial root - arising above ground, often from an axil. Provides a means for the plant to absorb moisture from the air. Aeruginosa (-us, -um) - deep green with blue colour. Aestivation - (estivation) - spending the summer months in a dormant state. aff. - abbreviation of affinis = "close to", "similar to", "related to", as a descriptor of unresolved taxa. Agriculture - the science of farming plant and raising animals. ii. in the fork or axil. iii. cells in basal angles of the leaf. iv. growth regulating chemical sprayed on fruit trees. Alate - with wings or wing-like appendages. Alatus (-a, -um) - with wings or wing-like appendages. Albiflora - with white flowers. Albo - white - as a prefix in a compound word. Albo-aurea - white and gold. Albo-marginata - with white edges or margins. Albo-maculata - with white spots. Albo-striata - with white stripes or striations. Albo-vittata - with lengthwise white stripes. Algae - simple plants in the Division Protista, consisting of single cells to multicellular organisms, arranged in colonies or as filaments, and containing photosynthetic pigments. Many common algae are green because their cells contain chlorophyll. Alkaloid - complex cyclic organic plant secondary metabolites, usually containing nitrogen in a cyclic ring, with a bitter taste and marked physiological activity on animals. Many of the 7000 known alkaloids are basic (alkaline). Many succulent plants contain alkaloids whose function may be to protect the plant from non-adapted herbivores, either by virtue of their unpleasant bitter taste or their toxicity. Examples of alkaloids include atropine, berberine, bryonine, caffeine, cocaine, colchicine, curare, lycorine, mescaline, mesembrine, morphine, nicotine, piperine, pyrrolizidine, quinine, strychnine, vincristine. Some of these alkaloids are used medicinally. Alpina - i. from an alpine habitat. ii. of a dwarf growth habit. Alpine - occurring above the tree line on very high and cold mountains. Alternate - of leaves or other parts, not opposite or whorled, but placed singly at different heights on the stem. Alveolate - of a surface or structure shaped like a honeycomb e.g. pollen or seed surface. Amphibious - able to grow in both water and on land or growing with part of the plant in water or mud and part in the air. Anastomose - to join together e.g. veins. Angiosperm - (meaning covered seed) - a flowering plant with ovules (seeds) enclosed in an ovary (fruit). Angiosperms developed about 100 million years ago (late Jurassic) and have become the dominant type of terrestrial plant, represented by at least 250,000 species, including both monocotyledons (e.g. Agave) and dicotyledons (e.g. Cactaceae). Angustata - with a narrow stem. Angustifolia - with narrow leaves. Annatto - ( E160b ) A water and alcohol-soluble yellow-red dye made from the pulp surrounding the seeds in pods of the tropical American achiote tree Bixa orellana. Annatto is used as a natural food colouring (confectionary, cheese, margarine, smoked fish, custard powder, Caribbean cuisine) and as a fabric or leather dye. South American tribes used the brick-red triangular seeds for body paint and lipstick. Annual - A plant that naturally completes its life cycle, from seed to seed, in one year. Annual Rings - layers of wood laid down each year by the vascular cambium of woody plants, typically in trees. During the season of active growth in the vascular cambium, xylem cells are being added to the circumference of the xylem tissue. At the start of the growing season the cells grow fast and are large, but as the season progresses towards the dormant period fewer smaller cells are produced and growth eventually stops as the plant becomes dormant. The difference in size of the xylem cells laid down at the start and later in the growing season forms a line within the wood marking the boundary of an annual ring. The size of the xylem cells is also affected by the growing conditions. Hence changes in the width of annual rings can indicate changes in the climate. Annulate - ringed or banded. Anther - the male part of a flower producing pollen, usually on a filament. Anther and filament together are described as a stamen. Antheridium - Pl. antheridia- the structure on the pteridophyte (fern) prothallus that produces the mobile male gametes. Anthesis - the action of opening a flower or period of time during which a flower is open. 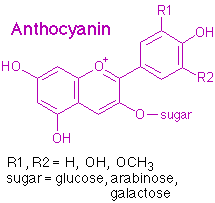 Anthocyanin - pink, purple, violet or blue water-soluble pigments colouring leaves, flowers and other parts. These pigments are sensitive to acidity or alkalinity (pH) turning red in acid and blue in alkali. Anthocyanins and betalains never occur in the same plant. Antibiotic - a substance that destroys or inhibits the growth of bacteria and other microorganisms. Apex - the top part of a plant or structure, the growing point. Apical - located at the tip or highest point. Apical dominance - inhibition of lateral bud development along a shoot by the terminal bud or growing point. Apical meristem - the un-differentiated tissue at the tip of a shoot or root, that by division produces the precursors of the differentiated tissues, including vegetative, reproductive or floral organs. Apophysis - an offshoot or projecting part. Apothecium - a cup-shaped fruiting body produced by some lichens and fungi. Appressed - turned upwards and lying closely, flat against something e.g. spines of some cacti. Aquatic - growing in water. Aquifer - a geological formation of permeable material that can store, transmit and supply water to a well or spring. Arachnoid - cobweb-like, with soft entangled hair. Arborescent - tree-like in size and growth habit. Archegonium - Pl. archegonia- the structure on the pteridophyte (fern) prothallus that produces the sessile female gametes. Areole - a modified side-shoot growing in the leaf axil, typically as a felted or multi-spined cushion, unique to the Cactaceae. From this point, spines, flower buds, stems, roots or offsets may arise. In most species, the areole is located on the tubercles or ribs. The areole is constructed so that breaking spines off the plant does not injure the underlying tissue. Argentatus (-a -um) - silvered. Argenteo - silver - as part of a compound word. Argenteus (-a -um) - silvery. Argentinus (-a -um) - from Argentina. Aril - an outer covering, or sometimes merely an appendage, of a seed formed from the funicle. May be hard, waxy or pulpy. Arista - an awn or bristle. Aristate - with an awn or bristle. Aromatic - with a resinous, spicy or distinctive smell. Articulate - jointed or with points of apparent separation, usually marked by a swelling, line or sudden change in colour. Hence: Articulata - with joints. Ascomycete - a large group of fungi including yeasts, milldews and truffles, with hyphae divided by septa and producing spores sexually within a typically cylindrical membrane forming a spore case or sac (ascus). Asexual - without the involvement of fertilisation, propagation by division or the production of bulbils, offsets or stolons. Aspera - rough to the touch. Atropine - a poisonous, bitter alkaloid extracted from members of the plant family Solanaceae such as Atropa belladonna (deadly nightshade), Datura stramonium (Jimson weed), Hyoscyamus niger (Henbane) and Mandragora officinarum (mandrake). Atropine dilates the pupils, increases heart rate, and reduces salivation and other secretions by inhibiting binding of acetylcholine to acetylcholine receptors. It is useful medicinally, including as a cardiac stimulant and a treatment for organophosphate poisoning. Cleopatra is said to have used an extract from Henbane to dilate the pupils of her eyes. Attenuate - gradually narrowed or tapered. Aurantica (-is, -um) - orange. Aurea (-a, -um) - golden. Autotrophic - nutritionally independent of other organisms. Self-feeding. Auxin - a group of plant hormones such as indole acetic acid, produced by the tips of growing shoots in plants, that regulate the amount, type, and direction of plant growth by stimulating elongation of cells rather than cell division. Auxins diffusing down the stem away from the growing point produce concentration gradients that are responsible for apical dominance and phototropism. At the correct concentrations, auxins induces growth and fruit production even if the plant hasn't been pollinated (e.g. seedless watermelon). Commercially, auxins are used to promote root growth from cuttings, to promote uniform flowering, and to set fruit and prevent premature fruit drop. Synthetic auxins such as 2,4-D and 2,4,5-T stimulate uncontrolled DNA and protein synthesis and are effective herbicides. 2,4-D is still used as a herbicide but use of 2,4,5-T has been banned because it tends to be contaminated with carcinogenic dioxin. Broad-leaved weeds like dandelions are much more susceptible to auxins than narrow-leaved plants like grass and cereal crops. At extremely low concentrations, 2,4-D is used to promote growth of orchid seedlings. Auxotroph - Auxotrophic - of an organism unable to synthesise a particular organic compound required for its growth. Axil - the upper notch or angle between the axis and any organ such as a leaf. Hence, "axilliary bud" is a bud in the leaf axil. Axial System - the vascular elements running vertically up and down a stem, in contrast to the lateral system running horizontally or out to the margin of the stem. The axial system carries water and minerals up the stem in the xylem and carries glucose up and down the stem in the phloem.